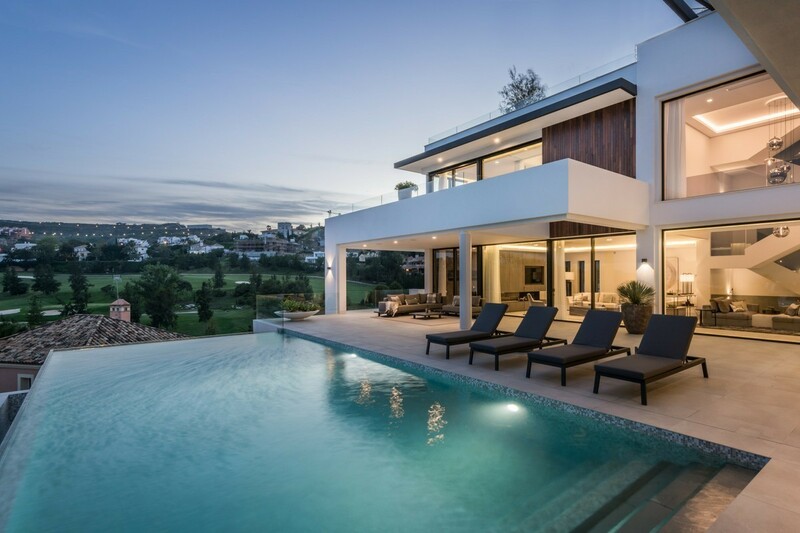 Brand New Villa with Amazing Panoramic Views on Golf & Mediterranean. Villa situated in the residential complex La Alqueria, Benahavis between Estepona and Marbella and just a few minutes away from Puerto Banus. Entering the plot through an automatic sliding door and a driveway down to the garage you feel how elegant this unique luxury villa for sale in Benahavis is. 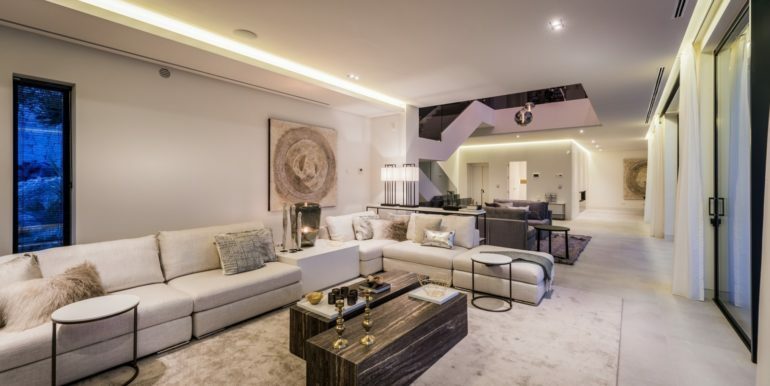 As you enter the villa from this level you’ll find a hallway with separate entrance to the garage, the elevator, staircase and huge rooftop terrace. This area boasts large windows with stunning views of the golf course and Mediterranean. 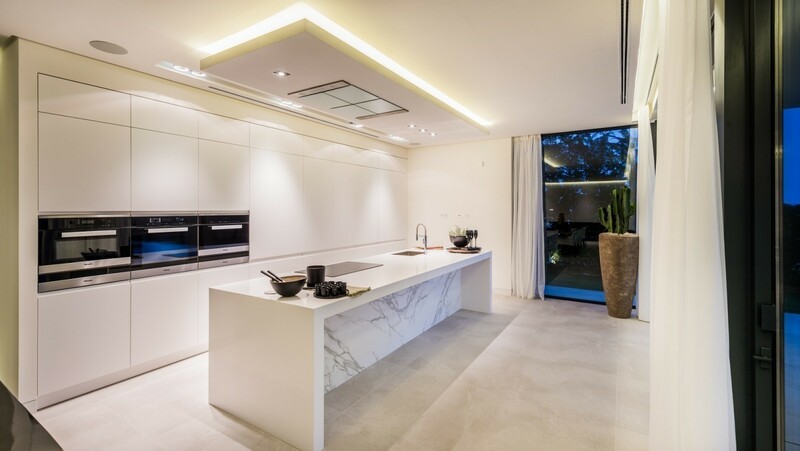 The ground floor of this spectacular contemporary villa for sale in Benahavis consists of the living area, an open plan kitchen and dining area. 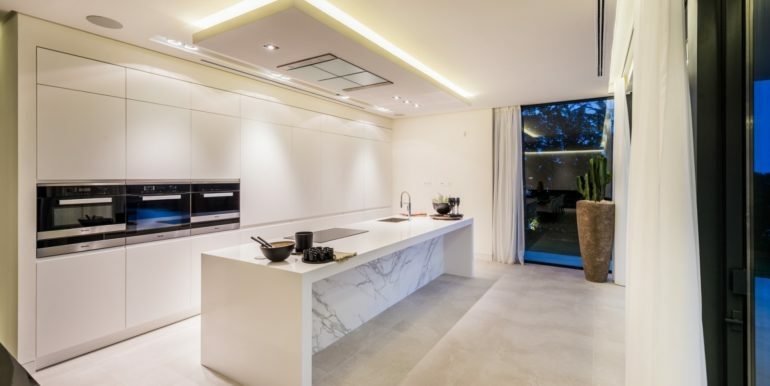 The kitchen is completed with a spectacular glass covered bodega – just one of the unique touches in this magical property. 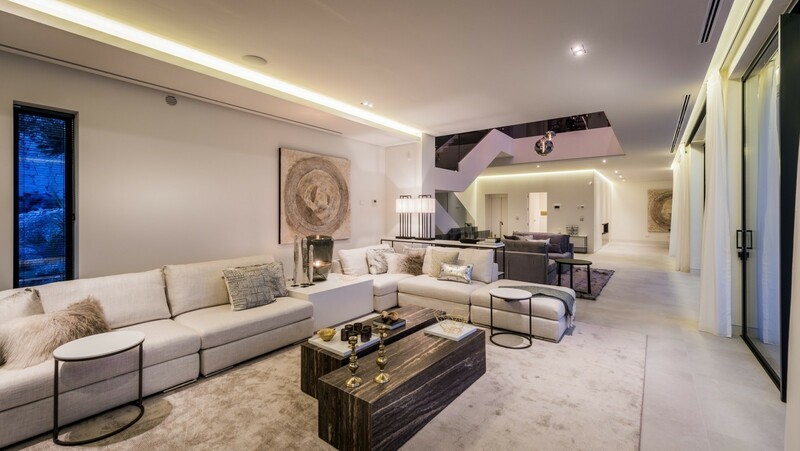 The dining area offers an integrated closet wall with space for a television and is finished with a panoramic gas fireplace, whilst the impressive double high ceiling, floor to ceiling windows and the glass front all enhance the feeling of space and light throughout. 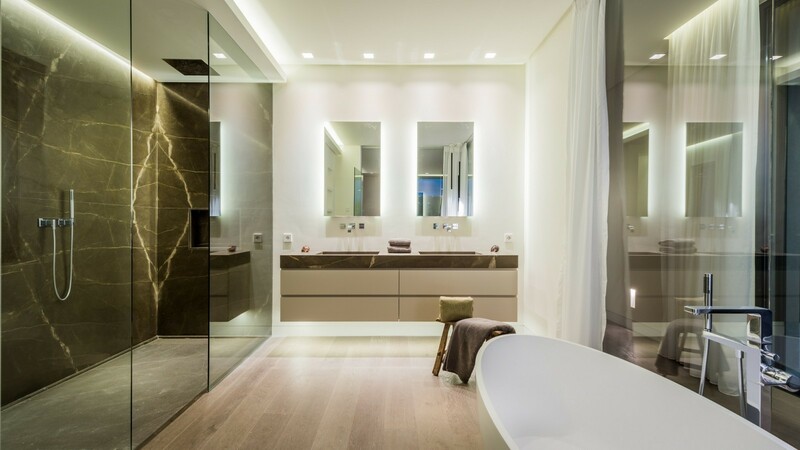 You’ll find an extra room on the West side of this spectacular contemporary villa for sale in Benahavis with separate bathroom that could be used as an office or further bedroom. Large covered and open-air terraces complement outdoor living, all overlooking the amazing infinity pool with views of golf, mountains and the Mediterranean. The large basement is home to the laundry room and an extra bathroom. 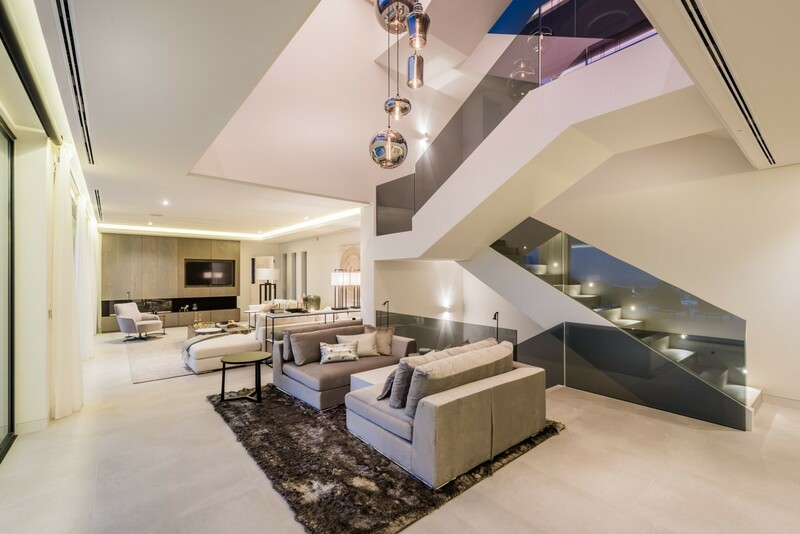 Up on the first-floor you’ll find 4 bedrooms with en suite bathrooms including the stunning master suite, all with access to magnificent terraces from where spectacular views can be enjoyed. The master suite also has a walk-in-closet and there is a space that can be used as a gym, wellness area or home cinema room. 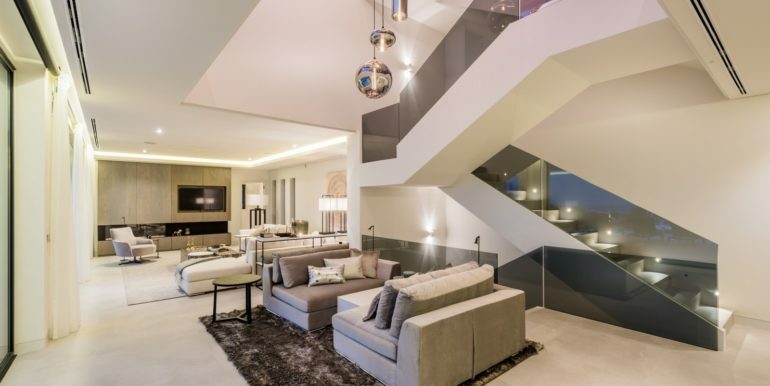 Top notch features of this spectacular contemporary villa for sale in Benahavis include individual controlled hot and cold air conditioning, underfloor heating, Sonos multi-room audio system, elevator, alarm system and domotics system for central control of screens, curtains and lighting. From your personal secure villa you’ll find a beautiful heated infinity pool with LED lighting and automatic cover that is the perfect place to relax and enjoy the stunning views. Bahia de la Plata Boutique Apartments. 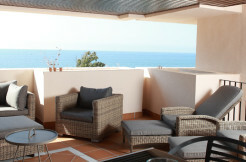 Cozy 2bedroom apartment with private garden in Dama de Noche, Puerto Banus. Luxury Apartments at Cortijo del Mar Resort. La Finca de La Cala, Mijas, Costa del Sol. 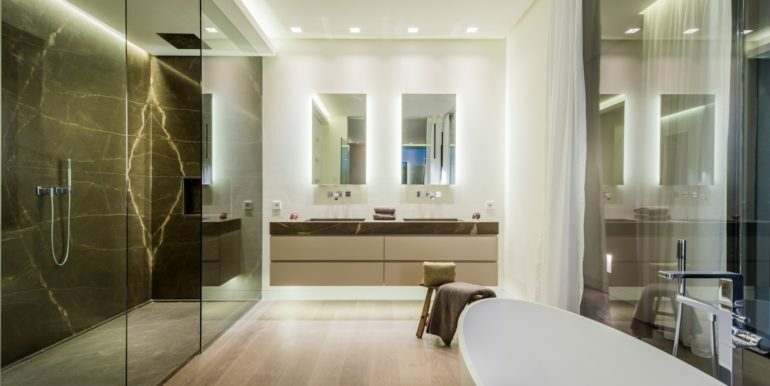 Modern villa close to the beach in Guadalmina Baja, Marbella. ALCAZABA Lagoon apartments, Casares, Costa del Sol.